This 61 inch cast-iron bathtub is perfect for those who want to place a tub in a smaller space and still enjoy all the benefits cast iron has to offer. The classical Slipper tub adds a vintage touch to your home bathroom. With timeless styling and ornate tub feet, this tub will provide warmth and durability because of its cast iron construction. With 7 inch faucet drillings on the tub rim, the tub filler can be mounted directly to the tub. The Double Slipper 72 inch cast-iron bathtub will surely be the center point of your bathroom. The double slipper design allows either end to be used. Modern and vintage designs are merged together with the pedestal base. The cast iron provides warmth and durability. With 7 inch faucet drillings on the tub rim, the tub filler can be mounted directly to the tub. This 54 inch cast iron bathtub is perfect for those who want to place a tub in a smaller space and still enjoy all the benefits cast iron has to offer. The classical roll top tub adds a vintage touch to your home bathroom. With timeless styling and ornate tub feet, this tub will provide warmth and durability because of its cast iron construction. With 3-3/8 inch faucet drillings on the tub wall, the tub filler can be mounted directly to the tub. Taking its design cues from traditional Craftsman furniture, the Archer line of baths reveals beveled edges and curved bases for a clean, sophisticated style. This bath offers a low step-over height while allowing for deep, comfortable soaking. Integrated armrests and a lumbar arch gently support the natural curves of your body. 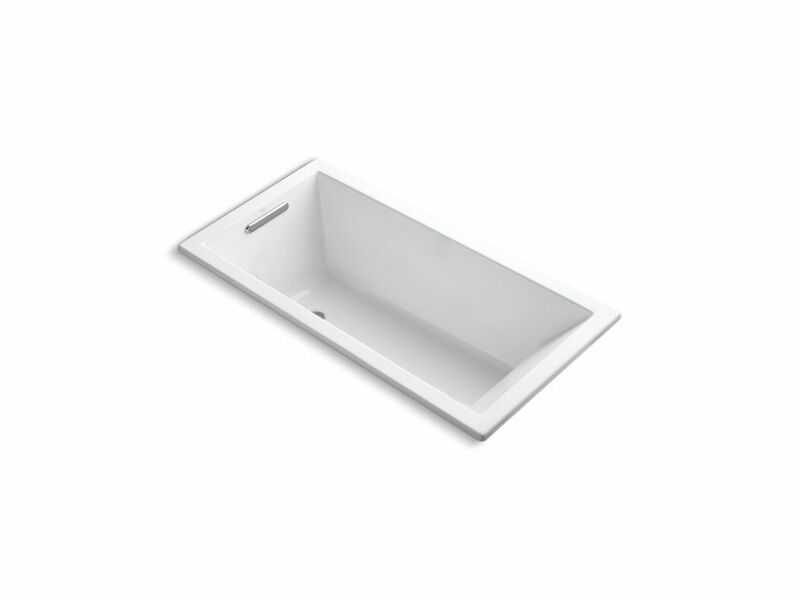 Underscore 5 ft. Rectangle Reversible Drain Soaking Tub in White Streamlined for simplicity, the Underscore bath exudes refined style with contemporary flair. A slotted overflow drain allows for a luxuriously deep bath as you relax against the comfortable sloped backrest. Underscore 5 ft. Rectangle Reversible Drain Soaking Tub in White is rated 4.3 out of 5 by 4. Rated 5 out of 5 by Wendy from The simple clean lines I was looking for. Very comfortable for a deep soak. We undermounted this ... The simple clean lines I was looking for. Very comfortable for a deep soak. We undermounted this tub and it looks fantastic! Rated 3 out of 5 by Bradley from I'm 6' tall and cannot fully stretch my legs out... I'm 6' tall and cannot fully stretch my legs out in this tub. Rated 4 out of 5 by SR from I wish someone would have told me we needed to... I wish someone would have told me we needed to get the drain kit with it. Had to wait another ten day for that. Rated 5 out of 5 by Robert from Great product. Easy to install. Great product. Easy to install.